The song appears on Sivan’s well-received sophomore album, Bloom. This is my first exposure to him (as far as I know) and it’s a nice one. Mellow but catchy. The third song tied for 15th on the Village Voice Pazz & Jop poll is another Kacey Musgraves tune. She clearly hit a nerve with Golden Hour, at least critically. It hasn’t been a runaway commercial hit, at least not yet. ‘Space Cowboy’ was on of the album’s early singles and one of its standout tracks. Musgraves does a nice job mining the cowboy metaphor throughout, and the misdirection of “space cowboy” actually being “space, cowboy” is nifty. Three songs tied for the 15th spot on Village Voice’s annual Pazz & Jop poll. One of those is ‘Shallow,’ the one element of A Star is Born that will definitely win an Oscar later this month. Then comes ‘Slow Burn,’ the lead-off track from Kacey Musgraves’ Golden Hour, which I already noted was the poll’s #1 album overall. 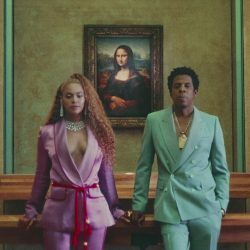 After the pair went through a difficult, and very public, rough patch (documented in stunning fashion on Beyoncé’s Lemonade and in less stunning but still admirable fashion on Jay-Z’s 4:44), they teamed up on an album titled Everything is Love, putting an exclamation point on their reconciliation. Drake occupies the 10th and 11th spots on Village Voice’s Pazz & Jop poll, by himself with ‘Nice For What‘ and paired with Travis Scott on ‘Sicko Mode,’ respectively. At #12 is a song (and artist) that’s completely new to me: ‘Night Shift’ by Lucy Dacus. Today is my daughter Fiona’s 13th birthday, so I hope ‘Night Shift’ is an appropriately celebratory song. Happy Birthday, Fiona!